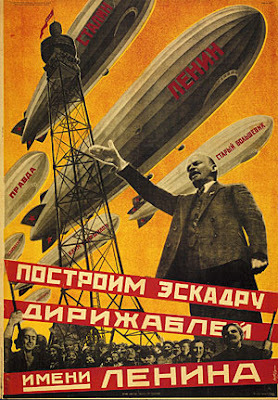 Let's build a zeppelin fleet for Lenin! This poster was released in 1931 after the Airforce Ministry of Soviet Union (Osoaviahim) declared plans to build a fleet of 7+ huge zeppelins. This was inspired by 230m German LZ 127 Graf Zeppelin airship which landed in Moscow in 1930 after its long-range voyage around the world. Zeppelins were considered to be very advanced means of transportation, mainly because of its huge payload compared to small airplanes of the era. So a promotion compaign started: workers, factories, kolkhozy - all were to collect funds for the fleet. The fleet was to be named after Lenin (1870-1924), whose cult of personality was propagated at that time. Joint efforts paid off well - more than 25 mln of rubles were collected, resulting in building of several small experimental zeppelins and 4 big ones, which in 1932-1937 were transporting loads all over the country. However, rapid development of fast airplanes which proved to be an excellent weapon against sluggish zeppelins, condemned the project. The country was on the brink of war, Nazi Germany was declaring plans to invade Russia. The country needed more airplanes, battle tanks, war ships and cannonry. The Second World War was about to erupt. Bureau of Automatics" (shortly DKBA) where now Russian state continous to manufacture aerostats and airships as for Ministry of Defense order as civil market. By the way, go on DKBA's site HERE. Thanks for the commentary, this is really valuable! I posted a link to you in the Steampunk forum.